Pan Haixia, lawyer and the wife of economic scholar and influential think-tank founder, Guo Yushan, posted a letter online that she wrote to her husband after he was taken from their suburban Beijing home by police officers on October 9, at around 2 a.m., on suspicion of “picking quarrels and provoking troubles” — a pretext used to silence China’s growing community of rights activists. Conflicted by the danger Guo’s activism brought to their doorstep, Pan’s heartrending words to Guo, to whom she wasn’t able to say ‘goodbye’, powerfully relate the torment activists and their families endure as targets of political persecution in China. Guo Yushan, an economist and rights activist, is the co-founder of the Beijing-based independent think-tank, Transition Institute. Highly regarded for its research and reports on a range of topics — including China’s tax system, its taxi industry, education equity, rights of migrant workers, the country’s costly dam-building spree, and the widely hated household registration system (hukou). Guo is also among the founders of the now-banned legal aid center, Gongmeng (also known as the Open Constitution Initiative). Gongmeng provided legal support to activists campaigning for political representation, land rights, migrant rights and other reforms. Guo Yushan is best known in the West for helping blind human rights activist, and self-taught lawyer, Chen Guangcheng, escape two years of house arrest and flee to safety at the U.S. Embassy in Beijing in 2012. Pan and Guo taken at the Tanzhe Temple in Beijing on July 17, 2011. These past few days have been torture for me, but they’ve likely been a thousand times harder for you. I can’t shoulder even half of this load for you, I can only write, and think of you, hoping that you can hold on to your original intentions, hoping that you can defend your most precious, most valued dignity. I can’t think of you, or of that day, without shedding tears. The haze was so thick, the night was so dark, and just like that you were gone, before I could give you any words of encouragement. When I heard them refuse your request to use the toilet, I rushed to the door, but I could only see half of your back. Bewildered and afraid, my mind went blank. I should have just rushed to you, no matter how they might have obstructed me; at least I could have let you know that I tried to say goodbye, and this small consolation might have brought you some warmth in the difficult hours ahead. No, I should have just been by your side throughout those two brief hours; why should I have cared about what they might confiscate from our house? I should have just sat beside you, holding your hand, and if they didn’t allow even that, I should have just sat there, looking at you, telling you that I love you and that together we can endure all of this. I will never be able to forgive myself. The day you left, you got too little warmth from me, and since then I haven’t been able to tell you how I feel. I’ll never forgive myself that. You silly old fool. I know you don’t regret it, and that this wasn’t unexpected. For you, that day, it was like the other shoe had finally dropped, nothing more. Maybe you’ve finally got peace of mind now. These past two years, you’ve been so stifled that it’s affected your temperament. Seeing so-called “obstinate” people suffer bitterly,2 one after another, and being powerless to help, has tormented you with moral anxiety, and it has exhausted you. I understand all this. Although I often argue with you about your personal safety issues, in my heart I’m conflicted, because I know you’ve done nothing wrong. You’re an honorable person who feels compassion when he sees other people suffer; it’s just that you’re more consistent in your logic, more thorough about it than most people. This is the reason I fell in love with you. Most of the time you couldn’t care less about your appearance, and you’re always scruffy, but your heart is constantly pure; you love life, love good wine, love your friends; you’re so playful, your life force is like that of wild weeds. It’s just a shame that my love brought you too little comfort, that it couldn’t equal the passion that suffering ignited in you, couldn’t equal the compassion that compels you to do things other people think dangerous but that you consider natural and just. These past few years, I’ve watched as your spirit has been inexorably worn down. It caused me anguish, but I was powerless to help. In my heart, it’s as though there are two of me: one of them, my lesser self, often hates you, hates that you don’t take care of yourself, hates that you make your family feel such a lack of security; the other, my greater self, watches lovingly as you do the right thing, and it’s like watching my own child, wishing only that I could take on more of the burden. These past few days I’ve tried hard not to think of you, or of that day. What’s been most on my mind is: when will you be able to come home? It seems that focusing on that makes me a bit more rational. The wind blew all night, and the next day, the haze had dispersed. Although it was still overcast, the air was cold and clean. I thought that maybe I made the right decision after all. Don’t make fun of me for being silly and superstitious; desperate people always resort, to some degree, to superstition. The evening I received the official notice,3 I was seeing friends off at the door when a little hedgehog suddenly ran across the courtyard (at first sight, I thought it looked so much like you, prickly little troublemaker). Our friends said that it was a good thing, and persuaded me to keep it and look after it. In my distress, I thought the hedgehog might have been sent by you to keep me company. But the next day, Mother released it, saying that an animal suddenly running into the house wasn’t a good thing, and that it had lost its way home, so we should let it go back. That evening, a fairly large lizard suddenly appeared next to my bed. I knocked and hit the wall next to it, but it wouldn’t move; sometimes it seemed like it was about to move, and its front legs twitched, but its back legs seemed stuck to the wall, preventing it from moving. Finally, I brushed it to the floor, and at last it ran away in a flash. How about this: if those animals were like you, wishing to stay at home but were cast out by me, was that not a bad thing? But what if their situation was like yours, that they couldn’t escape their predicament, but I helped them, was that not a good thing? Both options seem plausible, but I’ve lost my ability to judge. Then there is my friend who follows astrology and says that this month, Virgos4 will suffer retaliation from an enemy and everything will go wrong, and next month things will be better … In any case, in a state of half-belief, half-doubt, I am forcing myself to hold onto a thread of hope, the hope that you can come home soon. Fortune-tellers always said you have a good fate, but I think to myself, what can be good about the way things have gone for you the past few years? In the past two days, though, many of your friends who heard the news (some that have never contacted us before) called or sent text messages consoling me and keeping me company. Strangers have also sent their wishes through classmates of yours, and all this made me think that maybe the good those fortune-tellers talked about wasn’t a worldly good, but the great and rightful blessing that Buddhists talk about. The things you’ve done, the people you’ve helped, and on top of that all these friends who care about you — if this is not a great and rightful blessing, then what is it? Even if you lack physical freedom, your heart will always soar high, and if this is not a great and rightful blessing, then what is it? The sky is getting light, I must stop writing. Darling, there are so many things I want to say to you, but in my incoherence and confusion, I have only been able to write this much. I imagine that when you one day see these words I’ve written, you’ll either smile and praise my good writing, or furrow your brow and tell me my logic is muddled. Just know this: no matter how well or badly I’ve written, darling, none of these words can begin to describe even one part of my love for you. If I’ve complained or been cold from time to time, please forgive me — I was just using the wrong method to express my love. I will always love you, your silliness, your naughtiness, the way you think, your openness and your deep insight, I love it all. Facing this cold world, all we possess is love. I was always pessimistic about that; I thought love had little power, that it was just a faint candle in the darkness lending us a little warmth. But in a world this cold, all we can seek, apart from a clear conscience, is this little bit of warmth. You have a clear conscience, and you deserve this warmth. On even longer nights, although I cannot grab your hand, I am with you in the same darkness. Although they have not taken your path, many people are watching you, worrying about you. So, darling, no matter what you must endure, to the spirit or the body, in torment or torture, I hope you will often remember this warmth and remember: we all love you. Your silly wife who loves you. 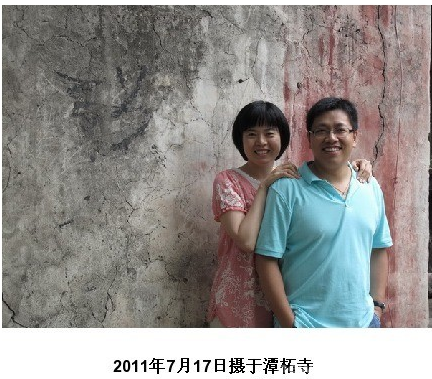 14 October, 2014, daybreak, 6.30 a.m.
1 When Pan Haixia published this piece on her micro-blog, she titled it, “A Letter to My Husband” (与夫书), in possible reference to “A Letter to My Wife” (與妻書), written in 1911 by the young revolutionary martyr, Lin Juemin (林覺民). Lin wrote his letter three days before he died in the Second Guangzhou uprising against the Qing dynasty; in it, he bids farewell to his wife and expounds upon his love of the people and the country. Today, “A Letter to My Wife” is taught in Classical Chinese classes at high schools throughout China, and is celebrated in Chinese popular culture as an example of patriotic bravery and heroic sacrifice. After many social media users made a connection between Pan’s letter and that of Lin Juemin, on October 14 the government’s official mouthpiece the Global Times published a critique of Pan’s letter, asserting that it could not be compared with Lin’s, and dismissing it as little more than an emotional outburst by a member of the increasingly irrelevant intellectual class. 2 Here, Pan uses the character 轴, a colloquialism meaning inflexible or stubborn to an undesirable degree. By placing the character in double-quotation marks, she uses it in a positive way to describe the unbending commitment of certain activists and public intellectuals to their causes. 3 Pan received an official notice stating that Guo Yushan had been detained on suspicion of “picking quarrels and causing troubles” (寻衅滋事). A copy of this notice was posted by former China Media Project (CMP) fellow and investigative reporter, Wang Keqin, and circulated via social media. 4 Guo Yushan’s star sign is Virgo. Read Pan Haixia’s third letter to Guo Yushan, dated December 4, here. Read Pan Haixia’s fourth letter to Guo Yushan, dated January 31, here.